The newsletter is a little later than usual, partly because I have been at home helping with the preparations for my daughters’ wedding on the 19th January - congratulations Carol & John! The second reason is my computer decided that the heat and dust of Zambia was all too much for it and promptly died just after I returned to the UK. Since I got my new post in Choma the temperature has been more or less above 35c, which can’t have helped much. 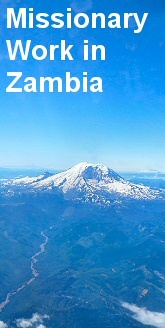 When I go back to Zambia in April I am determined my new one will remain in the office at home where there is air con! I thought time was flying by in September when I last wrote, but it certainly has whizzed by since then. As the new principal of Chodort training centre I find myself in a very different world. One of reports and protocol and meetings and - did I mention the meetings?? My days of playing with the kids from Kamatipa have gone and I now start work at 7.30 every day, as I hold the keys to the Chodort kingdom and I am by very nature of the work first in, and last out. Having said that, I am enjoying the new challenge very much, and am finding key people very supportive and friendly. My responsibilities at Chodort are split into 3 groups; academic, production and the new building site. On the academic side we have 3 courses at present. Computer applications, carpentry & joinery and tailoring and design. The carpentry and tailoring classes are aimed at vulnerable young adults, who, usually for financial or health reasons have not got their grade 12 certificates which would enable them to move into higher education. In order to give them a chance to learn a useful skill, the fees are fixed at as low a rate as possible, and they are also taught life skills, particularly around HIV and entrepreneurship; being able to make your own way in a land where 50% of the adult population are unemployed is vital. 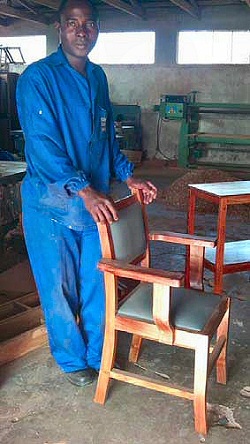 The second area of responsibility is the carpentry production unit, which employs 6 carpenters and some other staff. We have a very sophisticated carpentry workshop, with many machine tools, and make bespoke kitchens, furniture and doors for those locals who are rich enough to afford them. My office is next door to the (sometimes very noisy) production room which, apart from when we have our frequent power cuts, is perpetually on the go. Finally there is the building plot. This is some 7 acres of land patiently gathered over several years from 38 unused housing plots. Around 2 acres have been put aside for us to build a small estate of some 17 houses and the rest is for the new college, student accommodation and staff housing. Needless to say, like most Zambians, we are looking to God and our friends for support in this venture, which makes play4all seem a very small project. Play4all still continues in Kitwe in the capable hands of Ernest Sakala. It had its first anniversary at the end of January, so the volunteers celebrated with a meal and dancing. 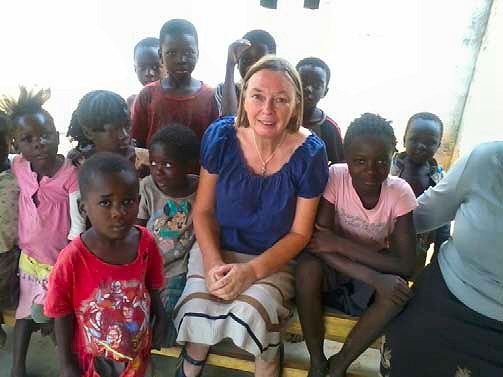 Volunteering in developing countries, particularly where a lot of donor money is coming in, can be almost a career to many people who live in poverty. A place in a week’s workshop often does not just mean free lunches and snacks, but a travel and "seating" allowance too, as well as perks like tshirts, satchels and the like. With all these extras and a workshop in very pleasant surroundings, it re-enforces the already ingrained belief that a musungu (white person) has money dripping from their fingers. This brings its own difficulties when trying to mobilise the community to do something for themselves rather than having something done for, or to, them. Play4all volunteers have sometimes struggled with the idea that as a project we aim to be selfsufficient, which will mean extra effort and fundraising on their part. Apart from some seed money to allow the volunteers to buy charcoal for sale locally (the profits are shared 50 / 50 with play4all) we manage on around £30.00 a month. Similarly, but on a much larger scale, Chodort is aiming for self-sufficiency but struggles as it subsidises those vulnerable youths who are unable to pay fees. Until the training centre becomes sustainable we also have to seek help with the building programme, but once we start to get a reasonable income from renting out the homes in the new housing estate we shall be more self-reliant. Other important events since I last wrote include the rebase of the Zambian currency. The government has knocked 000, off all the notes, so instead of 10,000 Kwacha being worth just over a pound it is now 10 kwacha. Sadly this means I am no longer a kwacha millionaire – but it was fun whilst it lasted! It also means people will no longer have to carry plastic bags full of money to the bank, and psychologically it is good for those who remember the days of President Kenneth Kaunda shortly after independence when the kwacha was equivalent to the pound. I am on furlough in the UK for the 3 coldest months of the year, and hope to meet as many of you as possible. Please do not hesitate to contact me by email about meeting up. I will be in Scotland from 15th to 25th March for my partner area and staying on a few days to meet other folk before going back to Zambia on the 10th April.